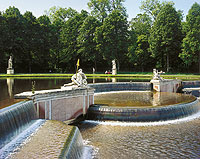 The history of the palace and the park of Nymphenburg are inextricably linked, and cover a period of more than 300 years. From 1664, Electress Henriette Adelaide of Savoy had a summer palace built from plans by the Bologna architect Agostino Barelli, with a small ornamental garden on its west side. Henriette Adelaide's garden was completely swallowed up by the park that was created later on. In 1701 Max Emanuel began extending his mother's palace, and also the gardens, which were planned and produced by Charles Carbonet, a pupil of Versailles creator André Le Nôtre. 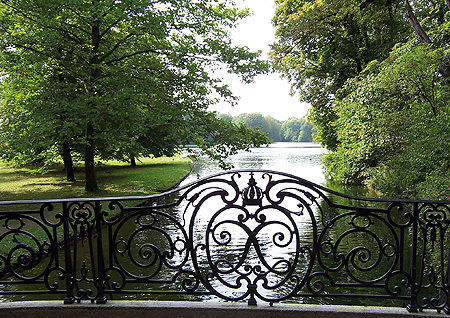 He was probably responsible for the canal which was laid out from 1701 in the existing break in the trees in order to divert water into the garden from the River Würm two kilometres away. The transformation of the palace and gardens into a famous baroque complex at the hands of Dominique Girard and the Bavarian court architect Joseph Effner did not however properly begin until 1715. It was now that the Nymphenburg canal system was completed and the garden was provided with a variety of water features and the necessary pumping machinery, and refinements were made to the design of the parterre, the hedge gardens and the extensive wooded park. By the end of Max Emanuel's reign (1726), there was an axially symmetrical garden radiating out from the west side of the palace, which was dominated by the four sections of the "Large Parterre", laid out with ornamental flowerbeds close to the palace. In the centre where the paths intersected was the "Large Pool" with the Flora Fountain. The boskets on either side of the parterre contained a number of garden rooms equipped for the pastimes of the court society. The other park gates will be closed half an hour earlier. The fountains usually run from Easter to mid-October from 10 am to noon and from 2 pm to 4 pm. The historical pump systems in the park’s pump houses are open daily from 10 am to 4 pm from Easter to the beginning of October. During the summer season, gondola rides are offered every day (in fine weather) on the central canal. Further information can be obtained at www.gondel-nymphenburg.de or by calling the gondola ride number 0175 6000468. From April to mid-October the exhibition "Friedrich Ludwig von Sckell and Nymphenburg" is on display in the Geranium House daily from 9 am to 6 pm. The admission is free. bus or tram to "Schloss Nymphenburg"